Most supermarket hummus pots have masses of oil added, and often cheap oil at that, to reduce the cost and increase its shelf-life. There has actually been media coverage recently of savoury dips being 'salt and fat traps'. This added oil is very unnecessary. You already have plenty of fat from the delectable sesame seed paste, tahini, which is over 50% fat, sometimes nearer to 60%. I like to compare it to another thing that kind of grinds my gears: supermarket guacamole often has double cream added. They take nature's creamiest, fattiest fruit, the avocado, and think 'clearly that's not enough fat for our population, so let's add the richest dairy product available'. What's more, this makes store-bought guac unsuitable for vegans! Rage. Breathe. Anyway. The best batches of hummus I've made have been without any added oil, but drizzled with olive oil to serve - much more satisfying. I like to use cumin too, which isn't very common in the hummus community (hummunity? ), because it provides an earthy, base note to the dip. Lastly, my recipe has 13g fat (good fats) per 100g, to supermarket versions which have 25g-30g per 100g. The salt content is also lower... but it tastes way better! This is because all the ingredients are fresh, and soaking and boiling chickpeas gives them way more flavour (and they're cheaper). 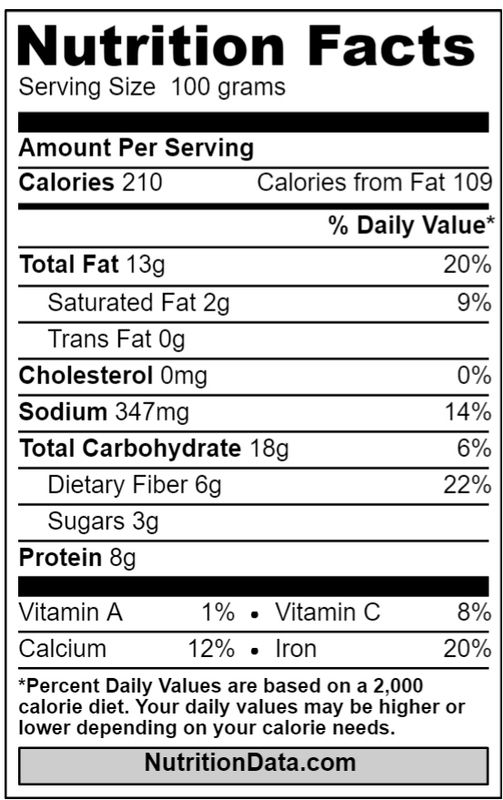 If you're interested, I calculated the full nutritional data for my hummus. You can find it here. If you are in a hurry, you can use tinned chickpeas, but I warn you they are significantly less delicious. If you are using them, substitute the chickpea cooking liquid in the recipe for the liquid left in the can. This cooking liquid, by the way, is known as aquafaba, and you can do some really cool things with it like make meringues or vegan mayonnaise. Put the dried chickpeas in a bowl and cover with twice the volume of water. Leave to soak overnight. The following day, drain the chickpeas and then put them in a large cooking pot. add about 3 times the volume in water and bring to a boil. Scrape off any scum that forms on the top. Simmer for 1 hour or until the chickpeas can be crushed between your thumb and forefinger. Drain them, reserving the cooking liquid. If using a stick blender, put the chickpeas into a large mixing bowl. Alternatively, add to the jug or bowl of a blender/food processor. Add the rest of the ingredients (using 120ml/½ cup of the chickpea cooking liquid at first). Reserve a few chickpeas for garnish. Now blend all the ingredients together until smooth. Add more cooking liquid if the hummus isn't smooth or creamy enough (it may need as much as a whole cup more). Taste and add more salt or lemon juice to your preference. Serve in a wide, shallow bowl with the reserved chickpeas on top as a garnish. Drizzle with extra-virgin olive oil and sprinkle with smoked paprika and some fresh parsley or coriander.